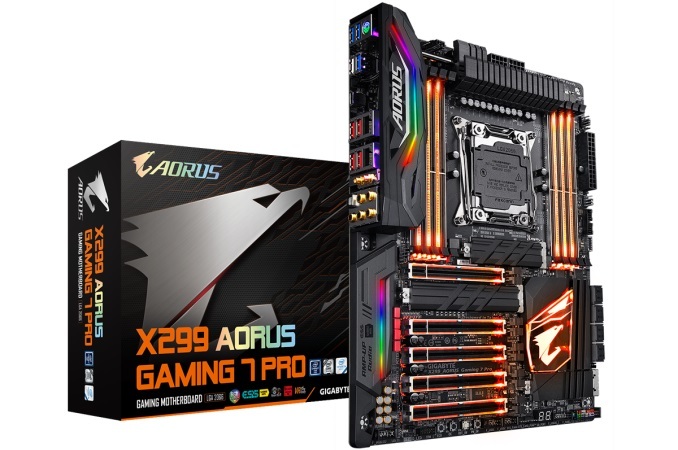 We have reviewed a lot of X299 based motherboards over the past couple of months, but our first Gigabyte/AORUS offering is the X299 Gaming 7 Pro. The G7P promises a slew of full-length PCIe slots, three M.2 slots with heatsinks, more USB 3.1 ports than most could use, and enough RGB LED lighting to have a full-on disco in a PC. See the details in our review, and bring sunglasses! The Gaming 7 Pro fits in at towards the top of the GIGABYTE X299 product stack, slotted just below the Gaming 9 and flagship Designare EX. The G7P offers users 3-Way SLI and Crossfire capabilities, three M.2 slots each with their own heatsink, a robust dual heatsinked power delivery with an additional fan, several USB 3.1 ports, and enough RGB LEDs to light up a room. If a user wanted a PC disco, this is the motherboard to have. GIGABYTE started its premium brand of gaming-focused AORUS products a couple of years back, with the intention to offer 'the most extreme gaming experiences for enthusiasts worldwide'. The AORUS product line ranges from gaming laptops to graphics cards, mechanical gaming keyboards, motherboards, and other hardware, aiming to give the brand a presence in the market. The devices are easily distinguished by the name itself as well as the Falcon symbol representing the lineup gracing the packaging and products. The GIGABYTE motherboard lineup for X299 has, at the time of writing, eleven motherboards. To emphasise the the AORUS brand importance, there are seven boards in that mix with the AORUS name. There are only a few non-AORUS boards available, in fact. The lineup starts at the entry level with the X299 AORUS Gaming and tops out at the Gaming 9. On the performance side, the X299 Gaming 7 Pro performed well overall, running with the pack on nearly all of the benchmarks. The G7P has a form of Multi-Core Enhancement (MCE) enabled by default as it takes all benchmarks to the 3.6 GHz range. The board did excel in boot times, taking over the crown as the fastest board we have recently tested. The rest of the results were right in the middle of the boards we have looked at. Overclocking was simple, with our new 7900X CPU topping out at 4.7 GHz and we hit our temperature limit (unfortunately we have had to swap out the previous CPU). This 7900X sample is a lot better of an overclocker, and so we should expect subsequent boards to also reach this value. With that said, the power delivery heatsink on the G7P stayed warm to the touch, peaking at 63C in our extended stress testing while clocked to 4.5 GHz. The G7P allows users to have nearly the full run of storage connectivity. There are eight SATA ports and three M.2 slots, with the M.2 slots all coming with pre-supplied heatsinks. The top and bottom M.2 slots support both PCIe and SATA drives while the middle slot supports PCIe type modules only. There is some sharing going on, as when using the bottom M.2 slot, SATA ports 4/5/6/7 will be disabled. The board comes with five full-length PCIe slots with positions 1, 3, and 5. These are the CPU connected slots and intended for use with video cards. PCIe slots 2 (x4) and 4 (x4) are both connected via the chipset. For connectivity, there is a total of five USB 3.1 10 Gbps ports on the back (4x Type-A, 1x Type-C) with another onboard header for additional front panel ports. Some of these are handled by ASMedia 3142 controllers, while others are using a Realtek solution, and this is the first board we have seen to use a Realtek USB 3.1 (10 Gbps) solution so far. This is also the most USB 10 Gbps connectivity we have seen on an X299 board so far. For networking, GIGABYTE has enabled an Intel I219-V NIC as well as a Rivet Networks Killer E2500 NIC alongside 802.11ac Wi-Fi. Audio comes via the Realtek ALC1220 codec. As far as pricing goes, we do not have anything concrete at the time of this writing and have reached out to GIGABYTE for an answer. The Gaming 7 (non-Pro) is priced at $400 from both Newegg and Amazon, so we expect the Pro version with the added Wi-Fi to be priced a bit higher. The $400+ price tag puts it at the higher end and competing with boards like the MSI X299 XPower Gaming AC ($440), The ASUS ROG Rampage VI Apex ($430), and the ASRock Fatal1ty X299 Professional Gaming i9 XE ($423). Prospective buyers will have to dig into the features to really see differences at this price point. For example, some boards offer a U.2 port or more than eight SATA ports, or buyers may look for a board with specific features. 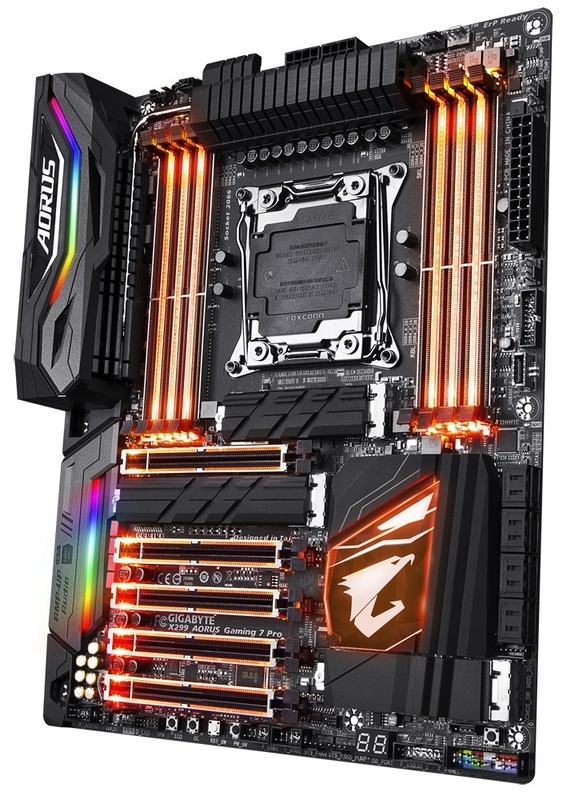 GIGABYTE has brought a total of eleven boards to market on the X299 chipset so far, 7 of them under the AORUS branding. The pricing starts at $210 with the entry-level AORUS Gaming and goes up to the Gaming 9 which hits the $500 mark. Sprinkled between the bookends are boards that will vary in features, appearance, and price filling in the gaps. The only thing missing in the lineup are MicroATX and Mini-ITX boards. Board partners have launched dozens of motherboards. Welcome to another episode of Pimp my Mobo. Yeah, don't care for the RGB crap. I have an corsair keyboard that lights up red for when its dark. That's it. The board feature list is nice but id like to see a compare to the rest of the line up and its competitors.